is warning screen in the browser (Edge) is not working as expected: if I click "Go Back" button nothing happens, and "I want to continue to this site anyway" is not clickable. Please, fix it ASAP. If the site that was blocked was opened in a pop-up then there is no site to return to so the 'GO BACK' button wouldn't do anything. I'm not sure why the 'I want to continue to the site anyway' link isn't working, however it could be due to caching. If the DNS cache is storing the blocked connection then it will just return you to the block message page/redirect rather than allowing you to proceed to the blocked site. To fix this you would need to exclude the site in Malwarebytes and then clear your DNS cache and then you should be able to reach the site. To create the exclusion simply open Malwarebytes and follow the instructions in this support article under the Exclude a Website section and you should then be able to reach the site, again, assuming that the DNS cache doesn't stop you in which case you'd need to clear your DNS cache and then relaunch your browser and try again. Just FYI, I tried to reach the site after disabling Web Protection and was still unable because it was also being blocked by my HOSTS file, so if you're using a security HOSTS file such as the one from hpHosts or MVPS Hosts then that could be the reason the site continues to be unreachable. You should be able to click on it and it should allow you to visit the site. It should also offer the option to exclude the site so that it won't be blocked going forward. That said, the issue with DNS caching still applies in those scenarios which might explain why it isn't working. For those cases I'd suggest excluding the website as long as you know it's safe then clearing your browser cache and DNS cache and then you should be able to reach the site without it being blocked. Just to clarify, the "I want to continue to this site anywa﻿﻿﻿y" string of text is not intended to be a clickable link that brings you to the blocked website. Clicking it or the blue circle to the right is only intended to reveal a message box explaining the implications of visiting the website and providing a link to instructions on how to setup a exclusion should you wish to circumvent the block. For reference, the message box is depicted below. The "Go Back" button is not intended to bring you to the blocked website either. Clicking the button performs an operation that is intended to return you to the previous page that was loaded prior to the block occurring and not the actual website that was blocked. Depending on how you access the website or how you have your browser configured, there may be nothing to return to. 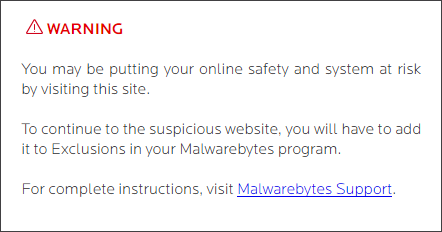 If you trust the website and wish to circumvent the block, you will need to add an exclusion for it in Malwarebytes. With that said, our Research team have reviewed the block on the website in question (the one referenced in the URL found in post #2) and determined it is no longer required. As a result, the block is being removed. This change will be included in a database update released shortly. 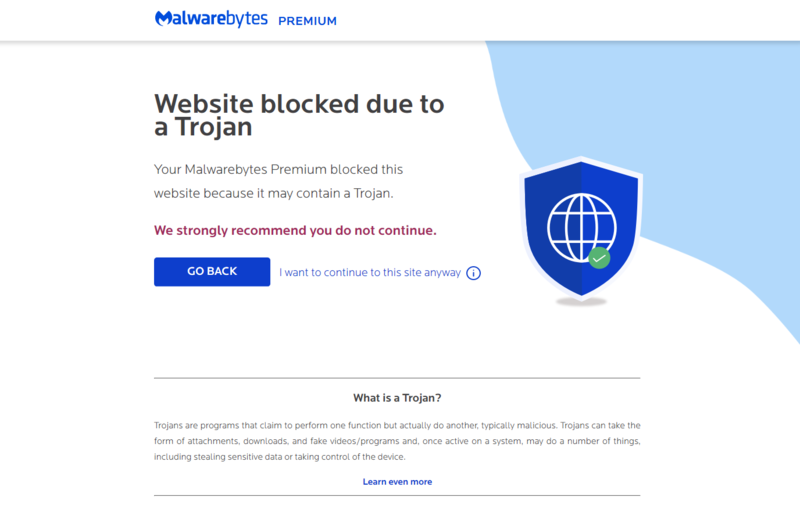 Later today, you should find that Malwarebytes no longer blocks the website (with or without an exclusion). Since other AVs offered a "proceed" link I thought it should be the same with because of "I want to continue to this site anyway" and not a generic "If you want to continue to this site anyway…". That would have helped IMHO. All right then, and thanks for support.